This is one of my favourite vegetables. Breadfruit when cooked, its flesh is soft, sweet and melt in the mouth. Mangaloreans have numerous recipes to enjoy this tasty vegetable. Some add it to meat curries instead of potatoes, some enjoy it as a dry vegetable/ sukke with a generous sprinkling of freshly grated coconut and others relish fried thin slivers of the vegetable either spice coated with the Mangalore chilli paste/ or batter coated (pakodas/ podis) as a snack. Breadfruit/ Jegguje is pretty hard to comeby outside Mangalore, but is now widely stocked in most Mangalore Stores. Breadfruit (Artocarpus altilis) is a species of flowering tree in the mulberry family, growing throughout Southeast Asia and most Pacific Ocean islands. It is called breadfruit because the texture of the cooked fruit has a potato-like flavor, similar to freshly baked bread. Breadfruit is a staple food in many tropical regions. They were propagated far outside their native range by Polynesian voyagers who transported root cuttings and air-layered plants over long ocean distances. Nutritionally, breadfruit flesh is an excellent staple, rich in proteins and with a range of amino acids. 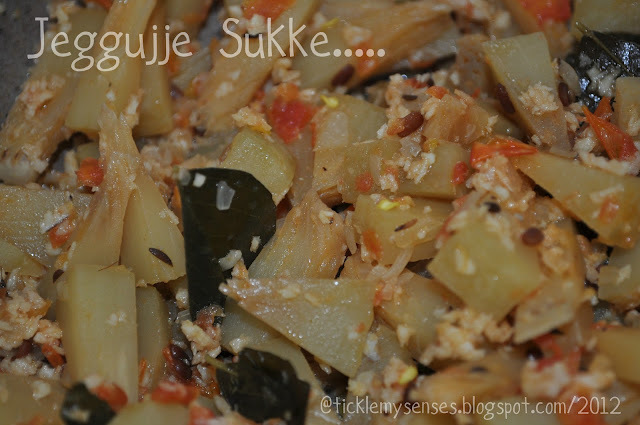 This is my moms recipe for Jegguje sukke or Breadfruit cooked in dry style with coconut. We kids grew up eating this lovely dish. 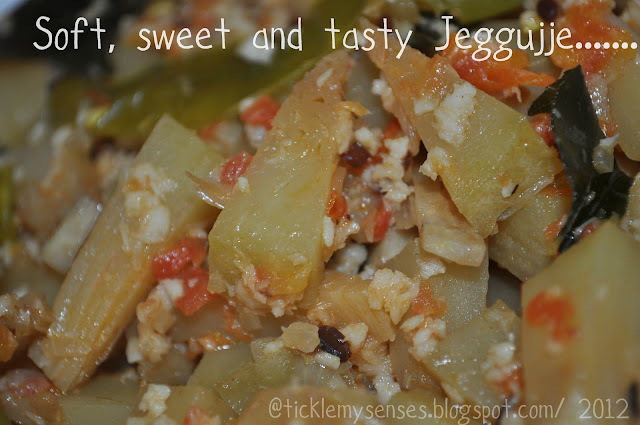 Serves:4 | Preparation time: 20 minutes| Cooking time: 20-25 minutes. 1. Peel the bread fruit and remove the fibrous part in centre. Slice them into ½ cm thickness. Then cut them across to make bitesize triangles. Keep them immersed in water till required. 2. In a kadai heat oil, add the urad dal, cumin seeds and fry till fragnant, add hing and curry leaves, fry for a couple of seconds before adding the slit green chillies and chopped onions. Fry onions for 4-5 minutes till soft. Add the chopped tomatoes and salt to taste and fry till tomatoes are soft ( 4-5 mins on a medium flame). 3. Add a cup of water to the kadai and close the lid. Allow the mixture to cook for five minutes and come to a boil. 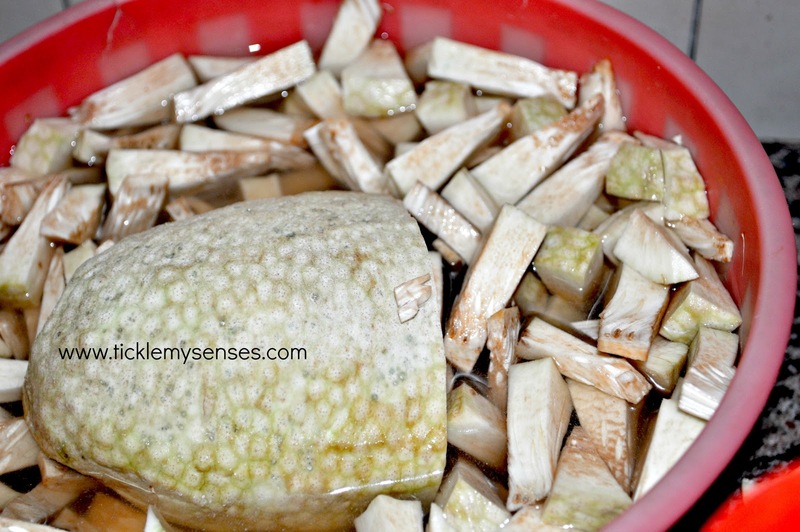 Then add the cut breadfruit pieces. Give a good stir. Cook till soft/ done. 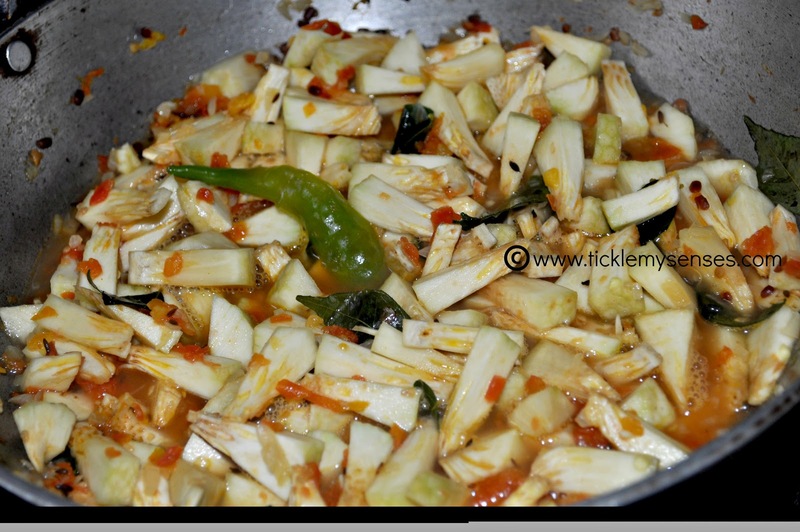 Add the freshly grated coconut, give a good stir, check for salt, take off the fire. Serve with steaming hot rice, lentil soup/ daaliso saar and a piece of Mangalore style fried fish on the side. Hey breadfruit is my fav...your dish looks very tasty. That looks delicious ! We called that jackfruit back home ( in the Philippines ) and I absolutely love it ripe or unripe ! 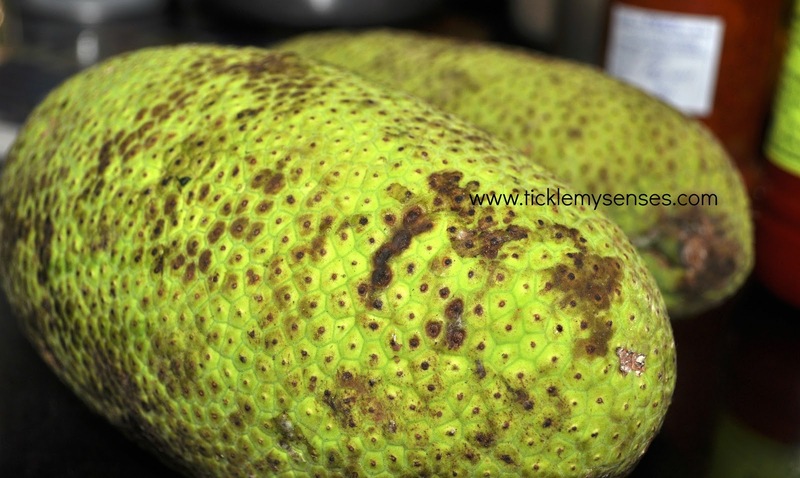 I have never seen breadfruit, I heard the voyage of the "Bounty" was to obtain it before the mutiny occurred. If I ever see breadfruit this recipe would be delicious because of the ingredients. U have a great space. Happy to follow you. Thank u for joining my space :)..